Pure vinegar. Except for the taste. Your grandma knew it. Models know it too. Nutritionists swear by it: Apple cider vinegar is the superfood of professionals. But delicious is another matter. Or should we say, was! Our Sparkling Vinegar combines apple cider vinegar with a fruity, tangy taste, without being too sour. Only natural flavours. No artificial added sugars. Your perfect low-calorie, feel-good refreshment for on the go. At the office. Or whenever you want to feel great. Like sparkling apple juice – but better. Bored of water? And apple juice has too much sugar? Then our Sparkling Vinegar will be your new favourite drink. A fruity, tangy apple flavour meets all the best properties of apple cider vinegar. And just the right amount of fizz. Real apple flavour from apple juice concentrate and natural flavours. But without all the calories. And with a feel-good guarantee. The superfood for your wellbeing. The natural sweetness of fruit. Whenever you feel like a tangy and fruity low-calorie refreshment. Does Sparkling Vinegar taste like vinegar? No! Sour is a thing of the past. Our Sparkling Vinegar tastes like ultra-delicious, sparkling apple juice, thanks to real apple juice concentrate and natural flavors. When should I drink Sparkling Vinegar? Whenever you feel like a tangy and fruity low-calorie refreshment! Why is Sparkling Vinegar good for me? Staying hydrated is important – and the better it tastes and the better it feels, the more fun it is to do. Sparkling Vinegar is the feel-good drink for your healthy lifestyle. Try it and find out for yourself. Can I drink Sparkling Vinegar as a refreshment between meals? Of course – in the morning, afternoon, and evening. Pre-workout or post-workout. Or whenever you feel like it. 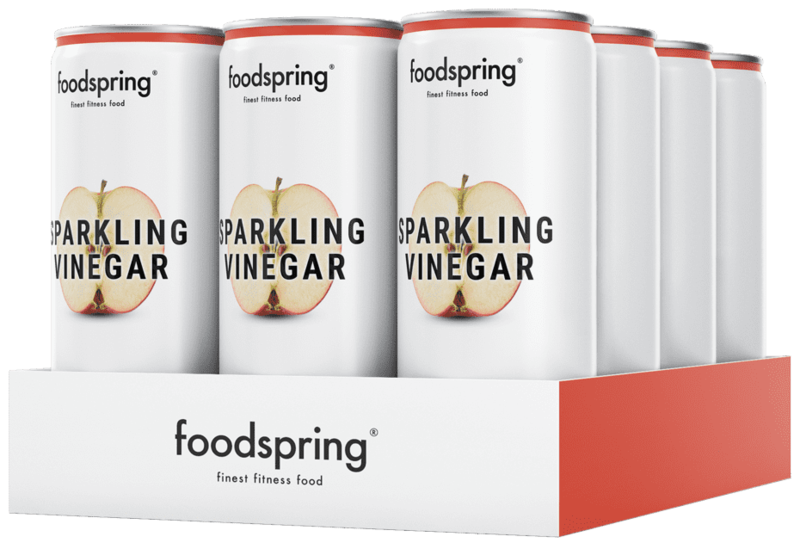 Our Sparkling Vinegar is low in calories, tastes great, and offers you the best of apple cider vinegar. There's never a bad time for it! Sparkling Vinegar Water will be back in stock shortly.